Students in Conestoga's School of Engineering and Information Technology completed the Épreuve du Nord Baja competition in fifth place beating all other competitors from Ontario. The event was hosted by L’Universite de Laval on February 2 and 3 and welcomed nearly 30 teams from postsecondary institutions in Quebec and Ontario. 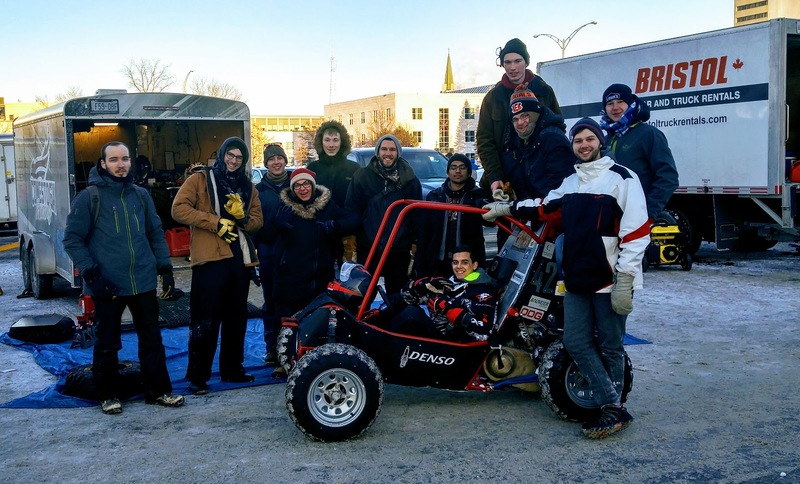 Conestoga's Baja race team completed the Épreuve du Nord competition at Université Laval on February 2 and 3.The team finished in fifth place beating all other competitors from Ontario. Baja is an off-road vehicle prototype built by engineering students in accordance with specific criteria set out by the Society of Automotive Engineers. The vehicles can reach a speed of 70 kilometres and are designed to handle obstacles. Amanda Logiudice, a student in the Mechanical Systems Engineering program, is a member of Conestoga’s Baja team, COBRA, and said the competition served as a learning opportunity that will prepare students for the international competitions to be hosted in the U.S. over the next couple of years. Logiudice is one of 20 Conestoga students involved with the Baja team - a mix of first-year Mechanical Systems Engineering, Mechanical Engineering Technology, Electrical Engineering Technology, and Welding Technology students. She joined the team to try something different and put her technical skills to the test. The DENSO North America Foundation extended its support to Conestoga’s Condor Motorsports Formula SAE and COBRA Baja race teams in May 2017 with a $50,000 donation to support the teams throughout the 2017-18 academic year. Since 2008, the foundation has directed more than $150,000 to the Conestoga teams. Founded in 2001, the foundation is the philanthropic arm of global auto parts supplier DENSO International America and provides grants to colleges and universities to help students advance their education in engineering, technology and other related programs. Visit the DENSO North America Foundation and DENSO Manufacturing Canada websites for more information.